#5MinuteFiction Week 76 #NaNoWriMo Edition FINALISTS! Did you like the prompt? It was sorta a last minute idea, so maybe not one of my best. It went kinda wonky for me. Hope you had fun with it. As always, you people do marvelous things with my little brain hiccups. So, who did our judge, Bryan Thomas Schmidt, @BryanThomasS, pick as the five finalists? Congrats to our finalists! Don’t forget, the winner gets a copy of the new book The Worker Prince by our guest judge Bryan Thomas Schmidt, @BryanThomasS! Entries are below so read and vote. Then come back tomorrow morning at 9:00 Eastern to see who wins! He’d sought them for years, the men behind the new snack. That salty sweet crispy wafer of sodium and sugar that was destroying the world even as people fell further and further in love. He knew he wasn’t making any friends, he knew only that they had to be stopped. They were secretive, moved around from place to place, city to city, even across national borders when it was necessary to escape detection. He wasn’t the only one tracking them down, just the only with murder in his heart. No. Not murder. Justifiable homicide. Saving the lives of those whose hearts were stopping, who couldn’t handle the sweet, the children who would been doomed to a live of obesity. High blood pressure. Diabetes. There were six of them. There were millions to save. When he finally saw them, he could hardly believe it. So long. They had become mythic. To see they were just men. To see them in their humble state. He had to remember their creation, unavoidable. The treat no man could stop eating. He pulled out his rifle. It was now or never. He wouldn’t get this second chance. Not now that he’d found the cooks that glazed the golden Lays. Markwan made his way up the trailing stairway. A cold breeze threatened to pitch him over the side. He made the mistake of looking down. All his training and he still looked down. 2,000 foot drop down into the pyrnoze mountains. Never a good idea to look down. Carefully, he carried the royal pillow in his outstretched arms. Behind him trailed the rest of the priests of Kwann. Only he, son of a fisherman and a whore, had made it to this high office. Finally they approached the 50 foot high tower doors. Guards in ceremonial dress and lochabers as tall as themselves opened the wooden inlaid doors. The entourage entered with great care, avoiding the trap spikes set in alternate locations in the ancient tile floor. “We come to you in the high season, Kwan Kwam.” He said as he knelt before the throne and cage. Inside squawked the magical Enru, bird of poison plumage and wild call. Inside the cage a series of mechanical levers made grinding noises. The machine was tripped by Markwan’s knees as he knelt. Down the gilded royal trough rolled the enormous egg, tumbling wildly while all held their breath. With a “humph” the egg landed in the pillow. It was beyond glorious. It was multicolored and laden with precious metals veins. This would be the mark of a great harvest. This would mean great prestige for his fledgling priesthood reign. Proudly, he turned for the long journey down the stairway. Halfway down, in pride, Markwan stopped to glory in his moment, in his station, in his stately bearing. At that moment, a gust of wind came by and blew the royal egg of harvest off his pillow and down the side of the gargantuan stairway. Markwan, horrified, paused for a moment while the priestly entourage gasped. Shrugging, Markwan took a deep breath and then ran and jumped off into the wild air, face full of shame and screaming. In the tower, the bird calmly starting its year long process of laying the next egg. Darci stretched her arms over her head when she awoke that morning. She rolled her hands over her freshly braided hair and sighed. Why on earth did Jamal think it okay to braid her hair, anyway? She never asked him for it. Sighing, she showered, brushed her teeth and headed for the closet only rapped in a towel. Mentally, she was imagining the black pencil skirt and red silk blouse she wanted to wear to work that morning. Physically, though…her closet was empty. The washer in the building is down, so I took all our clothes over to our other house to clean them. This outfit will have to do for the day. See you later, honey. And he had the nerve to write a smiley face after the word husband. She sighed. If only he’d sign those annulment papers, he wouldn’t have to do anything for her. Please, he still doesn’t have to. And what on earth does he mean, their other home? He needs to go back there and stay there, far away from her! You need to take better care of yourself. Enjoy a breakfast of champs! “What on earth!” she yelled. Sighing she rested her head on the steering wheel. Not anymore. She didn’t need a note from her husband to know why the needle pointed to F instead of E.
There’s nothing wrong with a nice goose to lay a great egg for you, but she wasn’t feeling the goose. She wasn’t feeling him at all. It had not been a goose, nor a swan, nor even a duck or chicken. Still, we searched for the origin of the mysterious eggs that were borne down the river to our village. Each one, bobbing along the currents, shells glittering in the sunlight or glowing in the moonless dark of winter nights, brought prosperity to whoever found it. The midwife was given herbs upon cracking hers open. The herbs proved to soothe the most savage birth, and no woman has died since while in her labors. The carpenter found a tiny hammer within one that he could use to set the heaviest nails in the strongest wood with the gentlest taps. Others found coins or gems, keys to long-lost secret boxes, and once, a seed that grew into a tree whose fruit no one had ever seen before. Always in bloom, always in fruit, it saved the village through the worst of the drought the past two years. The eggs had come slowly at first, then more and more until there would be at least one a day. That’s when the village elders decided that all the eggs must be brought to them for keeping. 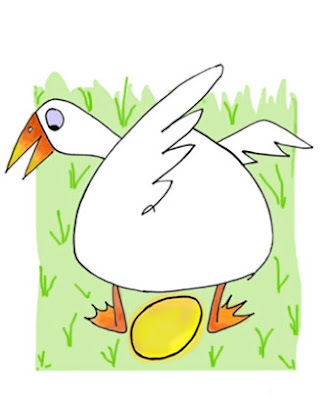 To spread forth the eggs’ benefits across the village, rather than to the lucky few who could spend their days waiting on the river banks. The eggs the elders opened proved rotten. The condemnation of the river’s bounty meant the elders’ blood must fill the river instead, and so they did. Some died trying to swim up into the rapids to catch the eggs first. Some fought over sightings. My own father died trying to find just one for our family, not because of violence but because he neglected everything else. He simply sat upon the river’s edge, waiting, until thirst or hunger did him in. When we found him there among the reeds, I knew what must be done. I gathered all our supplies of food and tools, my father’s hoe for defense. I would climb the mountain that fed the river, and find out why we were cursed with too many blessings. I found the tiny drakeling, like a dragon of the stories made into a child’s toy, though its fangs were sharp and its fire hot. She laid her eggs in a cave near the mouth of the river. Like a hen without a rooster, her eggs bore her kind’s magic but no life. No yolk to become a chick. Unthinking, she pushed out of her cave into the water the useless, older eggs to make room for the new. The ones made of gold sank, but the other floated free to destroy us. I lifted the hoe. I knew now where the golden eggs came from. I did what I must do. I struck. Gepetto winced at the pleading in the voice and hunched even more closely over the cogs and gears on the desk in front of him. His glasses had slid down to the end of his nose as he squinted in the lamplight. There was a faint hiss as he turned the gas up to offer more illumination. It glinted dully off the pieces of broken machinery all around him. It wasn’t the internal workings that disturbed him so much as the exterior – the arms, the legs, the eyes. Especially the eyes. Automatons weren’t supposed to look at you like that. He lifted his eyes to stare at the automaton that glowed like burnished brass in the light. But she was made of something far more valuable than bass. Gold, the most precious thing to him. Or almost most precious. Gepetto had wanted, no needed a family more. But in his pride; his hubris, she had paid the price. “Enough.” The voice was heartbreaking. He could hear her loneliness and the hurt. They’d hurt her. They’d coveted and claimed and stolen and broken… and like any father, Gepetto grieved. But also like most fathers, he wasn’t capable of letting go. This entry was posted on Tuesday, November 8th, 2011 at 2:11 pm	and is filed under #NaNoWriMo, 5MinuteFiction, Flash Fiction, Writers, Writing Competition. You can follow any responses to this entry through the RSS 2.0 feed. You can leave a response, or trackback from your own site. « #5MinuteFiction Week 76 #NaNoWriMo Edition!